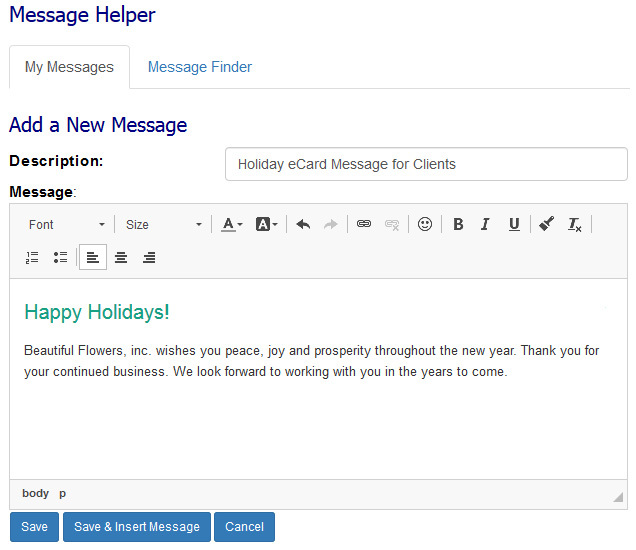 While composing your eCard message, you have the option to use our message helper to make composing the perfect message fast, easy and consistent. 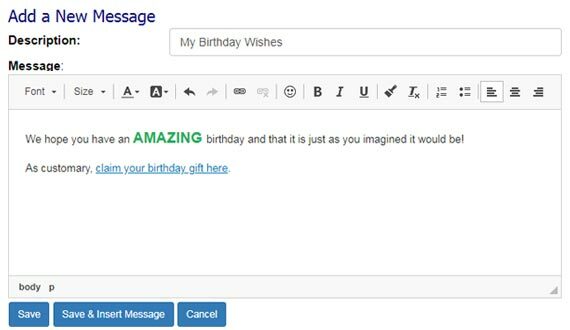 You can create, retrieve and search for commonly used messages, which you can easily insert into your eCards. Messages can also contain formatting such color, size, bolding, lists and hyperlinked text (see example). If you want to use one of our preset messages, navigate to the 'Message Finder' tab. 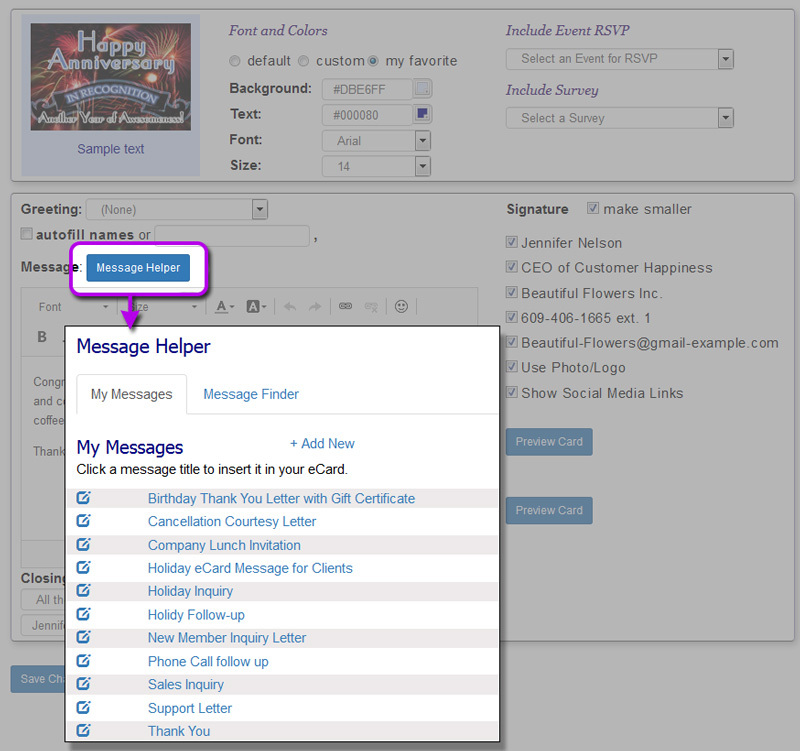 You can sort the messages by category such as birthday, anniversary, by a certain holiday, invitation or survey, etc. To use your own custom message, navigate to the 'My Messages' tab. If you have not created any messages yet, you can do so from this screen by following the steps in the next section of this tutorial. 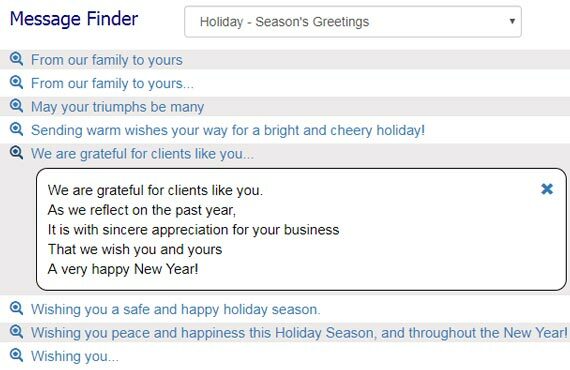 Whether it's one of your own messages, one from our message finder or one from your administrator, click the "Description" of the message to insert it into your eCard, invitation or survey. To view what the message will look like in the eCard (fonts, styles, hyperlinks, etc) click on the magnifying glass icon. thumb_up You can easily create message helper text that will be available to all of your plan members. Follow the instructions above for adding or editing a message. You will see an additional question: "Save in My Messages" or "Save in Company Messages." If you choose 'Save in Company Messages,' your members will be able to view and insert your message into their eCards, invitations and surveys.